We sorted through thousands of cut stones and put together a great combination of stones to be used by Bennie in making these rings. 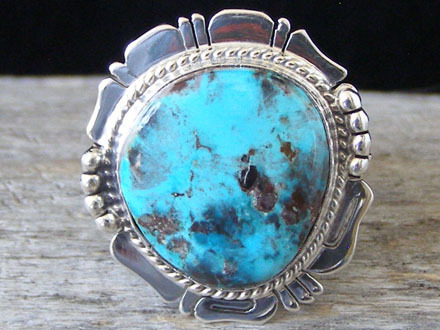 We gave Bennie thick stones with extraordinary color and shape; stones that we had cut for us from natural, rough rock turquoise by experienced lapidaries. This beautifully sculpted border work is known as "saw and file" work; initially cut out with a jeweler's hand jigsaw and smoothed and further shaped with a jeweler's file. We had Bennie make the shanks from heavy 14 gauge Sterling so the shanks would be appropriately sturdy and worthy of the fine stones used in these rings. The shank is split into five narrower bands before attaching to the ring back. This makes for a supremely comfortable ring. Buffed to a high shine and impeccably handmade. Ring face: 1 1/8" x 1 1/16"